It has been a rough 10 days in the metropolitan area. First Hurricane Sandy and then a nor’easter, called Athena. I know the snow is a hardship to many people but I love the Central Park Zoo’s beautiful animals as they see and taste their first steps on the freshly fallen snow. My good friend and zoocation buddy, Mary Schwalm has produced a desk calendar for 2013. The calendar fits into a CD sized case and is a free standing display. 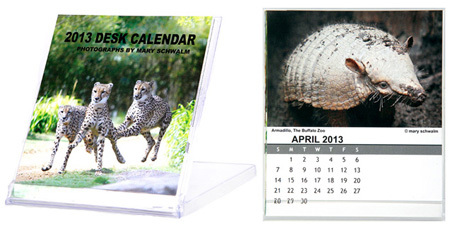 This popular 2013 animal themed Desk Calendar is available for purchase. It is only $10 plus shipping. You can e-mail her at mary@maryschwalm.com for orders and further details. The photo below shows you the cover and one of the months. They make great holiday gifts and they are going quickly. 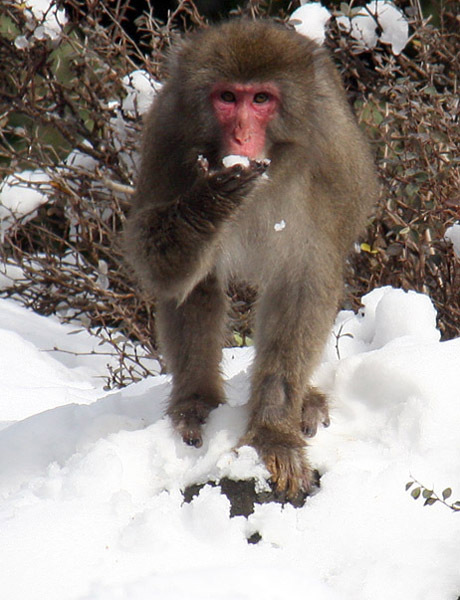 Great photographs — I love the snow! Glad to hear you survived “Sandy” relatively unscathed and after scaling 11 flights of stairs somewhat frequently, you might be in good enough shape to come up here and run the marathon! You should have come to PPZ! The dingo pups were thoroughly enjoying their first snow. Besides, we miss you!